Kate Robinson was born in June 1853 in Smith Township, Victoria, Ontario, Canada. She married Thomas Edward Harlow, son of John Hopkins Harlow and Martha (? ), on 13 August 1878 in Verulam, Victoria, Ontario, Canada, witnessed by Thomas Robinson and Lewis A. Williams of Verulam. 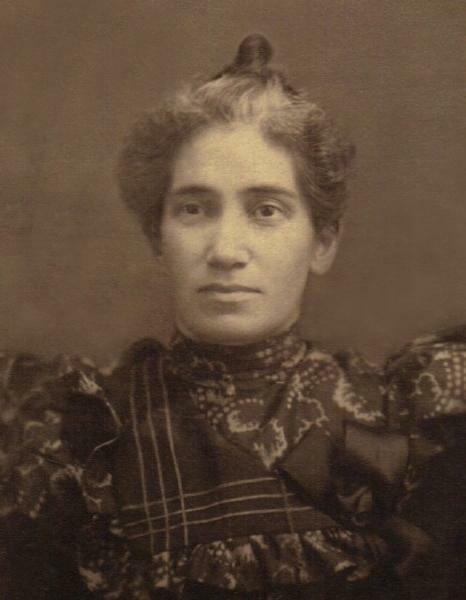 Kate Robinson was living in Verulam, Ontario, Canada, at the time of her marriage. Thomas Edward Harlow and Kate Robinson appeared in the 4 April 1881 census of Canada in Bobcaygeon, Victoria County, Ontario, Canada. Other members of the household included Ella Lorie Harlow, Susan Harlow, Robert Washington Harlow and John Hopkins Harlow. Kate Robinson became a widow at the 25 August 1885 death of her husband Thomas Edward Harlow. County of Erie, N. Y., Debtor to the Buffalo Orphan Asylum. County charges from October 1, 1890, to October 1, 1891: . . . #268, Violet Harlow, Oct. 1 to March 26, 25 weeks; #267 Edward Harlow, Oct. 1 to Mar. 26, 25 weeks. . . .
She married Gottlieb Weiler, son of Balthasar Weiler and Anna Walter, on 18 May 1893 in Buffalo, Erie County, New York, with The Rev. Geo. Whitman officiating. Kate Robinson died on 3 February 1903 at age 49 in Buffalo, New York. She was interred at Concordia Cemetery, Buffalo, Erie County, New York. The following appeared on 4 February 1903 in the Buffalo Courier: [Died] In this city, February 3, 1903, Kate, wife of Charles Weiler and mother of John, Gibson and Violet Harlow, [step-mother of] Mrs. Herman Oelheim, Charles, Anna, Clara, Fred and Amelia Weiler, and sister of Mrs. Edward Williams, Mrs. Louis Williams of St. Louis, Mo; William and Mathew Robinson of Petersburg, Ont., aged 49 years, 7 months and 16 days. The funeral will be held from the family residence, No. 806 Michigan Street, Thursday afternoon at 2:30 o'clock. Friends are invited to attend. Toronto papers please copy.